At 5536 N. 6th Street in Phoenix, Arizona, you’ll find sacred grounds. On these grounds, souls have been won to Christ. Believers have been baptized. Lives have been transformed. Memories—of both challenge and triumph—have been made. Of course, it’s not the address, the parking lot, or the building that make it so special; it’s the Lord, whose providential hand has preserved that space for his glorious work for three decades. And it’s the believers themselves, who had worshiped at another location even longer—since the 1940s. Though the name over the door has changed over the years, the Lord over all has remained the same. In view of The Gathering Place Church of God positioning itself for expansion, congregants from generations past-to-present recently reunited to unearth a time capsule, whose contents not only bring back cherished memories, but speak of an unchanging, eternally faithful God. To mark the fiftieth anniversary of the central Phoenix congregation in 1995, the creative idea surfaced to put together a time capsule to be opened in twenty-five years. It was something everyone could participate in, from the youngest to the oldest. It wasn’t rocket-science, but some careful planning was required to ensure contents would not be spoiled over time by the elements. The moment was ceremonious as church leaders gathered to pray over the future of the church, imagine what God had in store for the future, and begin digging. All were finally given the opportunity to toss a clod of dirt into the hole as the anniversary celebration drew to a close. 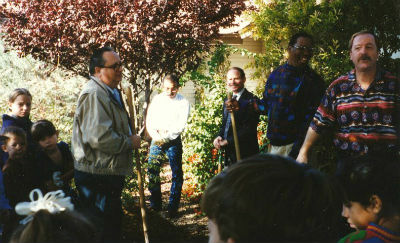 Congregation gathered for the time capsule ceremony in 1995. Though a full twenty-five years had not passed, two things led to this year’s digging out of the time capsule. The Gathering Place Church of God has been blessed by several creative opportunities to reach their community, and are preparing to expand their facilities. 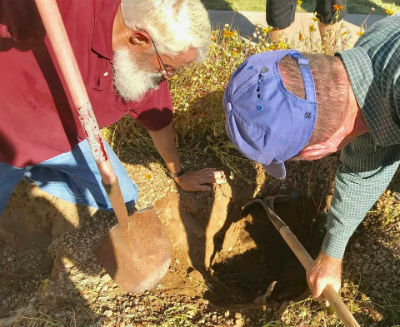 Though construction was not yet slated to begin over the spot where the time capsule had been buried, an aging demographic of friends from that 1995 ceremony suggested it was, in fact, time to retrieve the time capsule. Numerous artifacts were discovered inside the capsule, though some a bit damp and wrinkled, including—but not limited to—articles of incorporation, letters and cards from pastors and laypeople (several of which were addressed to their future selves! 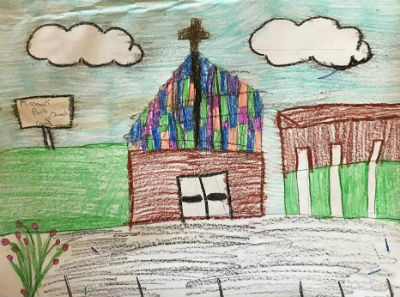 ), children’s illustrations of the church, Bible verses, minutes of board meetings, an address directory, event programs and service bulletins, and numerous photos. Sonia Baumann, longtime member of the congregation on Sixth Street, reminisced and rejoiced over the rich heritage she shares with so many in the Phoenix area and beyond. One of the illustrations discovered in the time capsule. “It was really great to see old friends, especially since some of them were only small children at the time the capsule was buried,” she explains. “That tells me that the story of our congregation was passed on to them by the older generation. I believe it is important to save items that remind us of our past, so we can share memories with our children and families who come after us.” She points out that photographs and writings are especially meaningful, as they preserve stories from those who lived and experienced such blessings from God. “In a church setting,” she explains, “it brings us closer together.” Indeed, their experience has demonstrated that a time capsule is a meaningful project that any church, anywhere, can do. Meanwhile, the present-day congregation at The Gathering Place has discovered several opportunities for community outreach, and has their sights set on a nonprofit café and a garage where people, especially those financially strained, can learn basic auto maintenance skills. 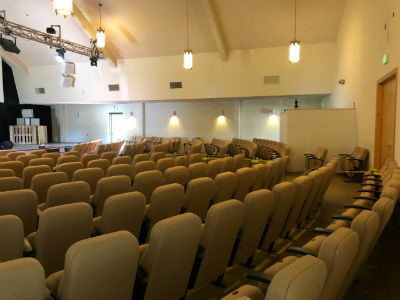 In addition, they just completed some interior renovations, including new sanctuary seating—thank you, North Hills Church of God and Christ’s Church of the Valley! Paying it forward, and with kingdom partnership in mind, The Gathering Place donated their pews to a church in Mexico. New seating at The Gathering Place. This entry was posted in All Church of God, Western and tagged anniversary, Arizona, AZ, CCV, celebration, ceremony, chairs, Christ's Church of the Valley, community, creative approaches, discovery, heritage, history, Mexico, North Hills Church of God, partnership, Paul Johnson, pews, Phoenix, reminiscence, seating, special activities, The Gathering Place, time capsule. Bookmark the permalink.